It’s time to streamline your security installations and maximise your opportunities. Wire in the panel and expand wirelessly with the EURO 46 V10; delivering everything from bells-only to HomeControl+ App functionality. Pick the panel, then add the communication preference. Easily navigate through the menus of the EURO 46 V10 with similar uniform menu-driven programming. Simple ‘YES/NO’ questions allow fast and efficient installing to save both time and money. Future-proof your installations. It’s time to streamline your security. No longer will you fit a panel dependent on the communicatION preference, instead, fit a panel and then add the communicator required. With HomeControl+ App compatibility as standard (with optional IP communicator) you can offer greater value and futureproof your installations. The same programming you have come to love, the same accessories, just less hassle and greater up-sell opportunities. Pyronix are delighted to introduce the brand-new hybrid control panel to the V10 range, that is compatible with any communication method and able to deliver Grade 3 security! The EURO 46 V10 delivers more opportunities, greater efficiency and more profitability than ever before. Following the successful launch of the Enforcer V10, Pyronix introduces the latest addition, so that whether the initial installation requires a wired or wireless fit, there is now the perfect solution. Fit the Enforcer V10 for a wireless installation or the EURO 46 V10 for wired and still benefit from both sets of peripherals thanks to the hybrid nature of both control panels! Wire-in the brand-new panel and enjoy all the benefits of both EURO 46 and EURO 46 APP with familiar programming and the same full range of Pyronix peripherals, but with more possibilities and only one choice to make! The benefits don’t stop there, as with either Enforcer V10 or EURO 46 V10 panels, communication preference is no longer a consideration. Instead, you simply fit the panel with the required communication method. The V10 range even automatically modifies its programming options to suit! 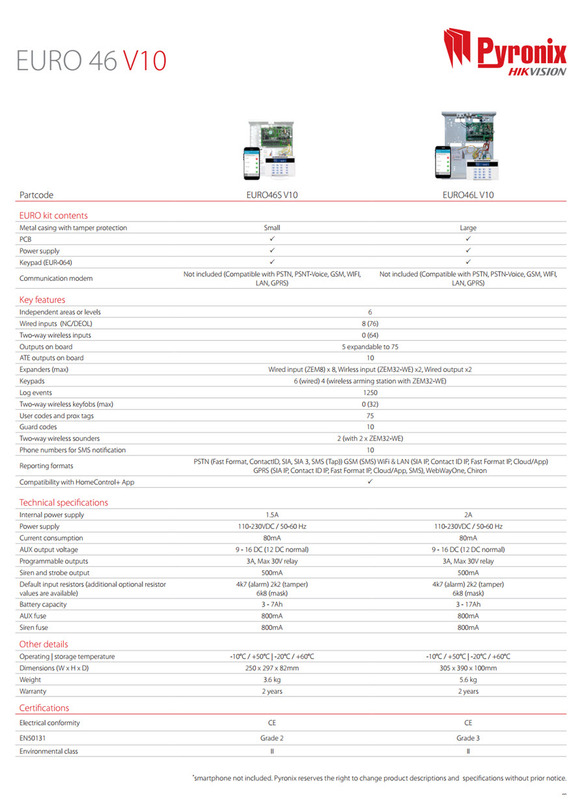 For the EURO 46 V10 the communication preference also includes the brand-new DIGI-WIFI/XA, which is fully compatible. Not only does the V10 range change how to pick and adapt a security system, but the EURO 46 V10 is available in large version to deliver Grade 3 solutions! So, pick the EURO 46L V10 variant and deliver Grade 3 security, with remote control from anywhere through the HomeControl+ App, while enjoying remote monitoring, diagnostics and maintenance.